Tubulin Beta 3 antibody LS-C18220 is an unconjugated mouse monoclonal antibody to Tubulin Beta 3 (TUBB3) from human, mouse, rat and other species. Validated for ELISA, ICC, IHC, IP and WB. Synthetic peptide corresponding to amino acids 443-450, ESESQGPK, of human class lll beta-tubulin. Recognizes the beta III isoform of human tubulin which is specific for neurons. Species cross-reactivity: mouse, avian, porcine, rat, bovine, sheep and monkey. Does not identify beta tubulin found in glial cells. 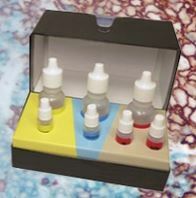 Suitable for use in Immunoprecipitation, Immunocytochemistry, Immunohistochemistry, Western Blot and ELISA. Immunocytochemistry (Fixed): 1:100-1:500. Immunohistochemistry: 1:20-1:100. Paraffin embedded, formalin fixed tissue. High temperature citrate buffer antigen retrieval is recommended with paraffin embedded tissue sections. Western Blot: 1:1000. Positive control: Brain tissue or neurons of any type. Short term: 4°C; Long term: -20°C. Avoid freeze-thaw cycles.